When you hit an afternoon slump, you may be tempted to run to the vending machine in your office and purchase an energy drink. Or, if you’re an athlete, you might turn to sports drinks to stay hydrated while you’re powering through your daily practice session. While such beverages might make you feel more alert and powerful, consuming them really isn’t wise. In fact, energy drinks and oral health in Westfield are inextricably linked — and not in a good way. Tooth enamel is the hardest substance in the human body, but it is far from invincible. When it is exposed to acid for prolonged periods of time, it becomes soft and eventually begins to wear away. Unfortunately, energy and sports drinks are highly acidic. Researchers performed an experiment wherein they immersed samples of human tooth enamel in such drinks for 15 minutes, followed by soaking them for four hours in artificial saliva. They repeated the cycle four times for five days in a row. Even after such a short length of time, the tooth enamel had suffered significant damage. Teenagers and young adults are at an especially high risk of developing oral health problems due to energy and sports drinks. Studies indicate that between 30 and 50 percent of teenagers consume energy drinks, and up to 62 percent of them have at least one sports drink per day. Of course, not all energy and sports drinks are equally as damaging. In fact, energy drinks can cause twice as much damage as sports drinks. The least harmful energy and sports drinks are ones with low amounts of sugar and that are not highly carbonated. Sip some water after you finish your drink to rinse away lingering sugar and acid. Chew sugar-free gum after you drink; the chewing action will promote saliva production and help to rinse away some of the acid. Don’t slowly sip on your beverage throughout the day. Consume it relatively quickly so you minimize the amount of time that your teeth are exposed to the acid. Visit your dentist in Westfield, NJ for routine checkups. They’ll let you know if your energy drink habit is harming your teeth and encourage you to make choices that will protect your smile from future damage. 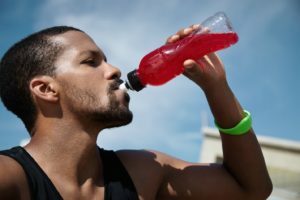 Energy and sports drinks are tempting pick-me-ups, but they aren’t worth risking irreversible damage to your tooth enamel. Say no to these harmful beverages so you can keep your smile as healthy and whole as possible. Dr. David Weinman is an experienced and compassionate dentist in Westfield who offers a range of preventive and restorative services to patients. If you have questions about how you can take the best possible care of your teeth, or you would like to schedule an appointment with Dr. Weinman, contact our office at 908-654-7200.